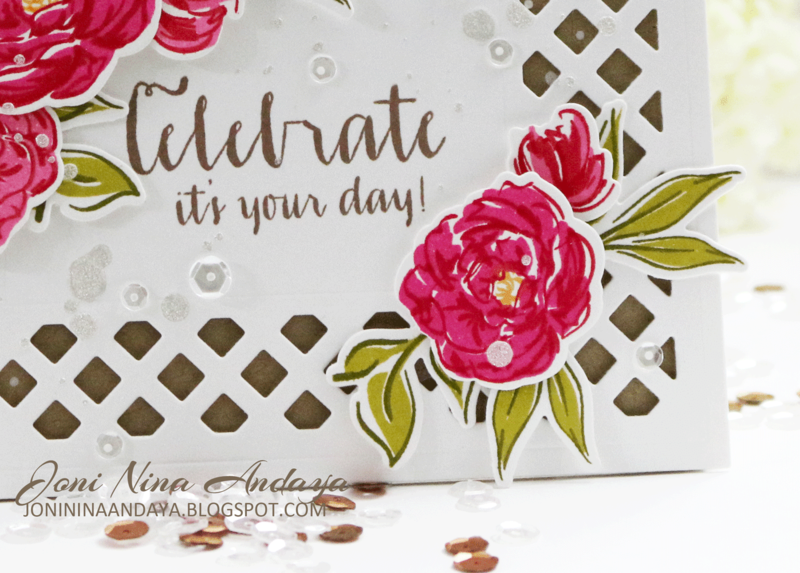 Papell with Love: Wplus9 - September Release - Pretty Peonies & GIVEAWAY! 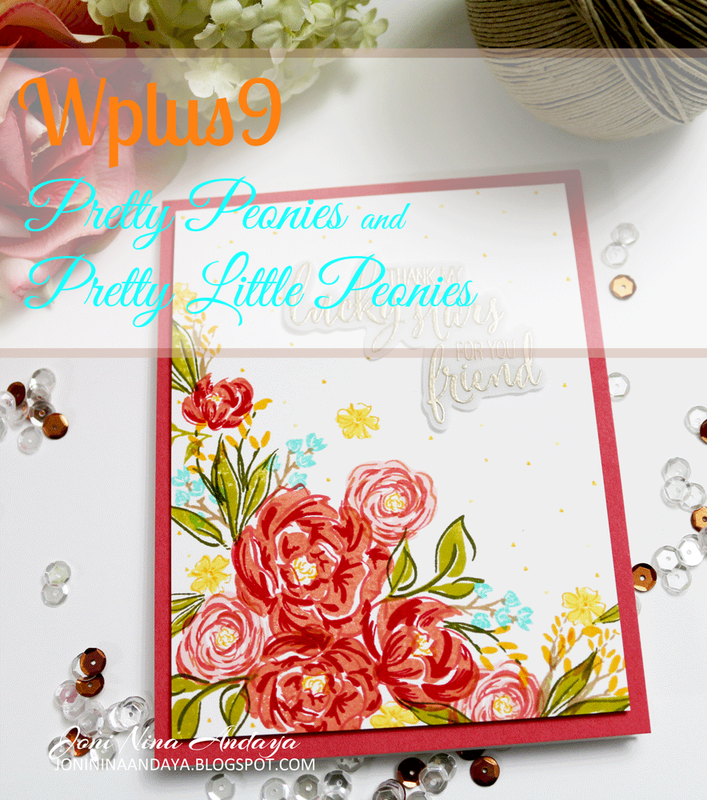 Wplus9 - September Release - Pretty Peonies & GIVEAWAY! Hello Everyone...very exciting week for Wplus9! This September they are doing a special release...I know you guys will love. both of these stamp set have a coordinating dies to go with them. For my first card I first die-cut all the dies that matched the images that I will use on the card. Next, I then stamped all the images, the flowers are mostly three step stamping and the leaves are two steps. 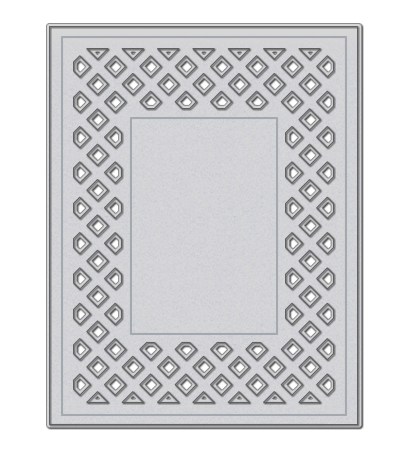 Lattice Frame die that it will also be release on September 5th. I then, adhere the fame die on the Kraft panel then adhere on the white card base. I also did some splattering using Studio Calico in Shine and added the Pretty Pink Posh sequins in Sparkling Clear in 6mm and 4mm. For this second card I did not do any masking, I just stamped the images in random. These stamp sets are so easy to create images with, these are mostly three step stamping and the leaves are two step stamping. 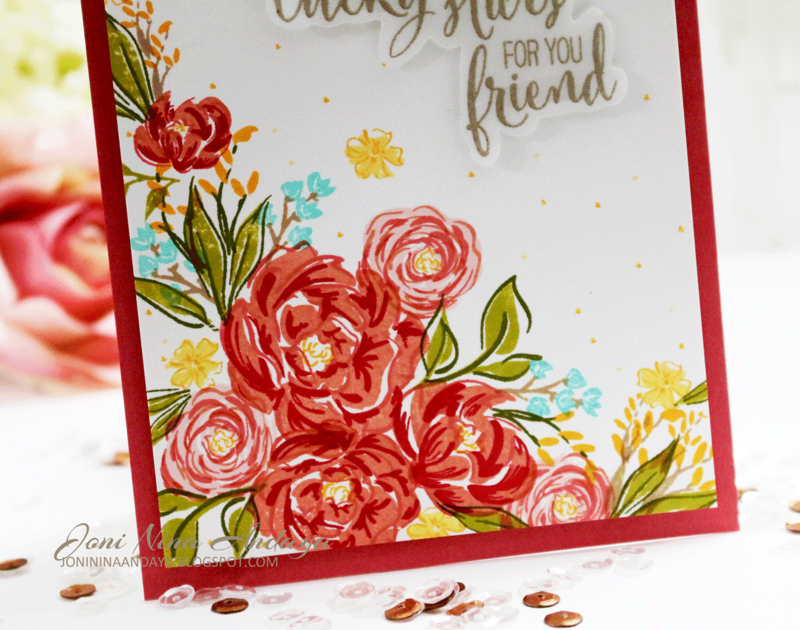 You will get lots of dimension with these stamp collections even with just one layer card, which I did on this first card, I really love these flowers. When you stamp this images, they don't have to be align because they are to mimic the watercolor images.....that's how I see it when I stamp it :). The sentiment is emboss in vellum using the Pearl Embossing Powder in Champagne from Michaels the Recollections brand. 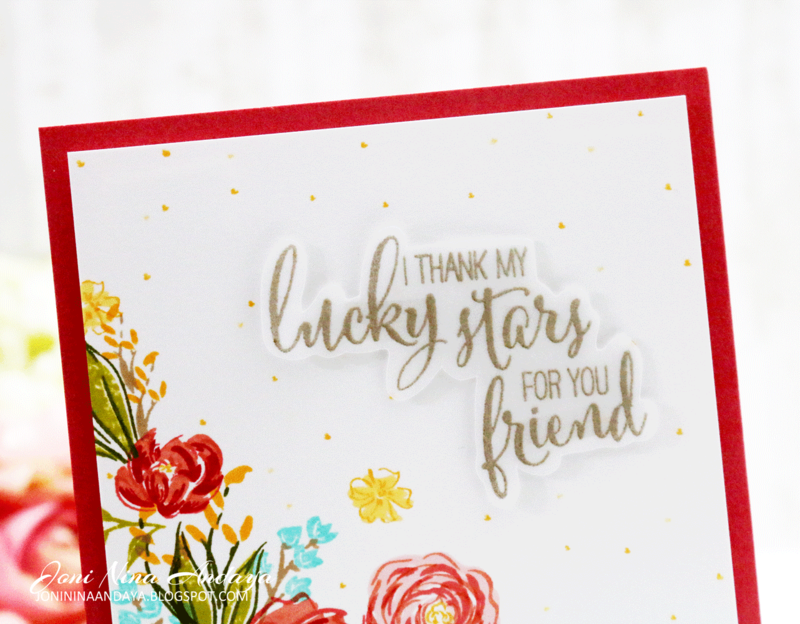 The sentiment is from the August release Lucky Stars was fussy cut and adhered with clear foam tape. Here's the close-up of the bottom of the card. My other teamie they are also showcasing some sets for the September release. Don't forget to visit Wplus9 Blog for the Giveaway! Would you like to win Pretty Little Peonies, and the Pretty Little Peonies Companion Die before you can buy it? Just leave a comment by 10:00 a.m. EST on 09/03/14 to enter. We will select One Random winner from All Comments. Winner will be posted on our Releaser Winners page by noon at Wplus9 Blog. 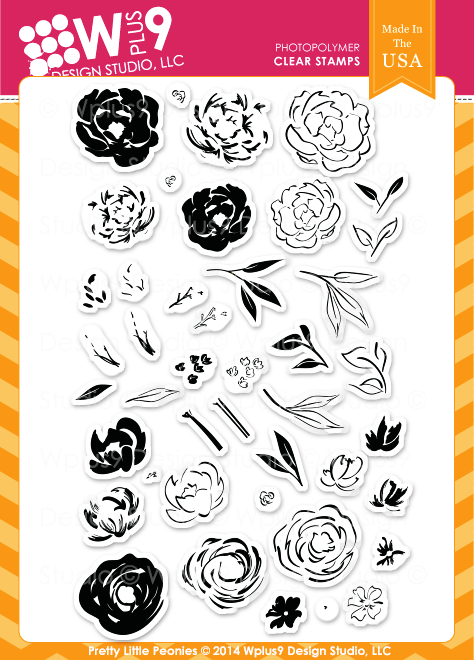 Your cards are beautiful with this pretty flower stamp set. I just love your cards, they are so beautiful! Gorgeous! Absolutely gorgeous! I can't pick which one I like more. I am thrilled she is releasing a peonies set! I LOVE PEONIES! Both of your cards are GORGEOUS! What a great release from Wplus9! Joni, your work is so beautiful and artistic. I hope that you have a lot of cards displayed at your home and framed. You rocked pretty peonies! What a fabulous special September release!! Can't wait till the 5th! 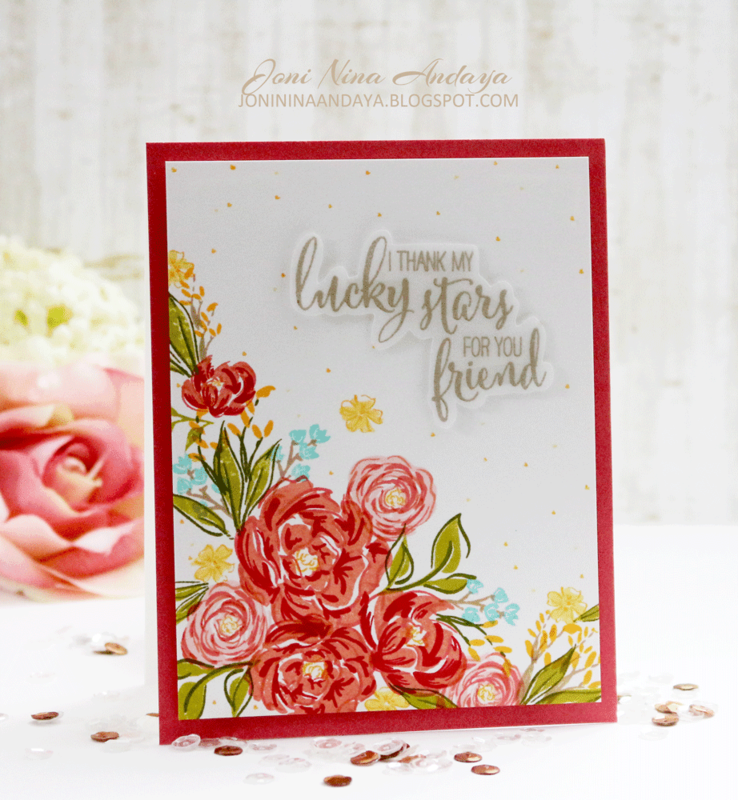 Peonies are my favorite flower, so I'm so delighted with this new release! Thanks so much for the chance to win! Oh my!!!!' Soooo gorgeous! These cards are absolutely stunning! Wow these cards are gorgeous! 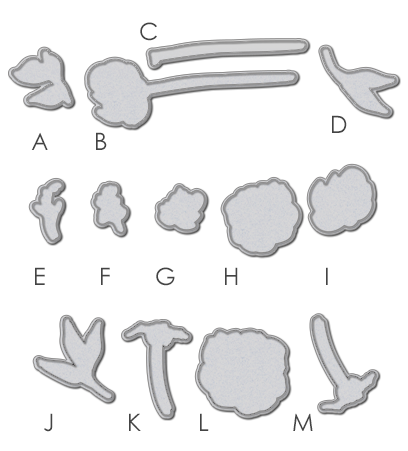 Absolutely love the peonies stamps!! Beautiful cards, Joni! Love everything you've shown us today! WOW Joni you have done it again.. these are stunning.. Fabulously stunning cards! I just love this peony set! 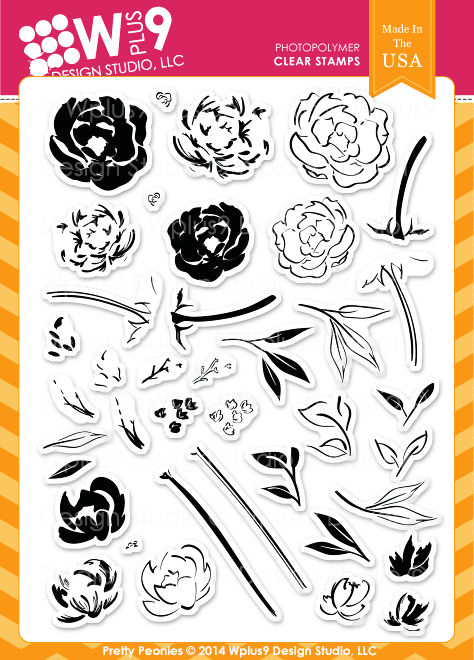 WPlus9 has the best floral stamps! Just when I think you can not top the last card you made....you blow me away with a new one!!!! A-maz-ing!!!! So gorgeous! Can't wait to get my hands on the peony set!!! Your cards are so beautiful, they are like little works of art! These cards are GORGEOUS! I just love everything about them! 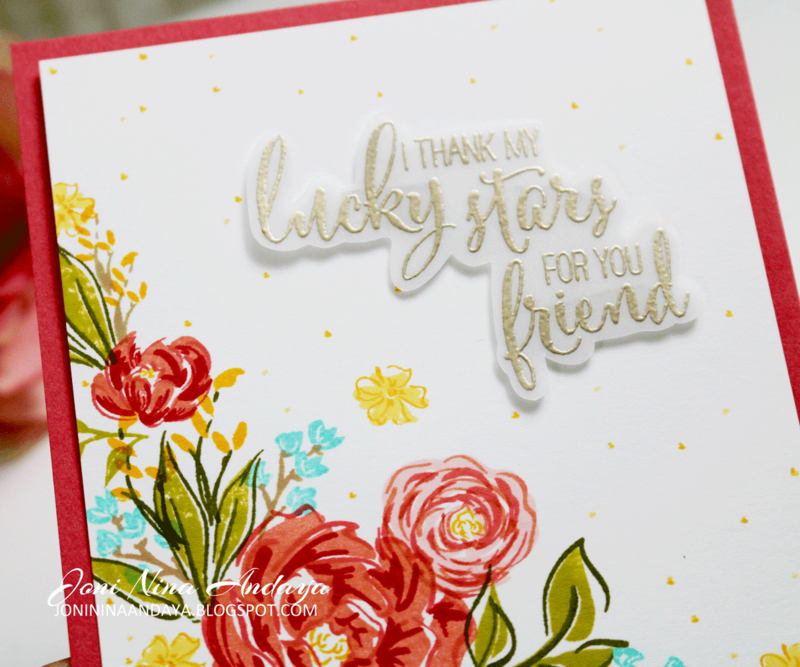 i love these 2 step dies and the way you've designed with them is so beautiful - and i'd love to win it too!! Joni you never cease to amaze me, these are gorgeous!! So, SO beautiful.... you had me at "peonies"! I love what you did with the new peonies sets! Your cards are gorgeous...they look like art!!! I recently found you.Sorry I was totally removed from the card making world and did not know all the awesome designers till now.Your cards are always wonderful.I love all the WPlus 9 stamps and have been slowly collecting all the new ones.Love what you did with your cards.they are gorgeous! Great cards! These are my favourite products from this release! Oh my goodness. These cards are STUNNING. Love the peonies on the lattice frame! So so so beautiful!!! Joni, I am absolutely blown away with your amazing cards! I will definitely be picking up some WPlus9 goodies on the 5th! These are SCRUMPTIOUS!! I can't wait to play with this Special release! These cards are gorgeous!! Absolutely stunning!! Wow! So beautiful! I love these bright colors! And I def. need some of that clear foam, who is the maker of it? Thanks so much! So beautiful, Joni! You rock these flower stamps. Wow these are both just so beautiful. WOWWWWWWWWW these are both so gorgeous!!! Well done!!!!!!!!!!! Joni, your cards are stunning! You really know how to make these stamps shine. oh my goodness those peonies are gorgeous! and your cards are so perfect with them! Wow, wow, wow! Such gorgeous cards!! 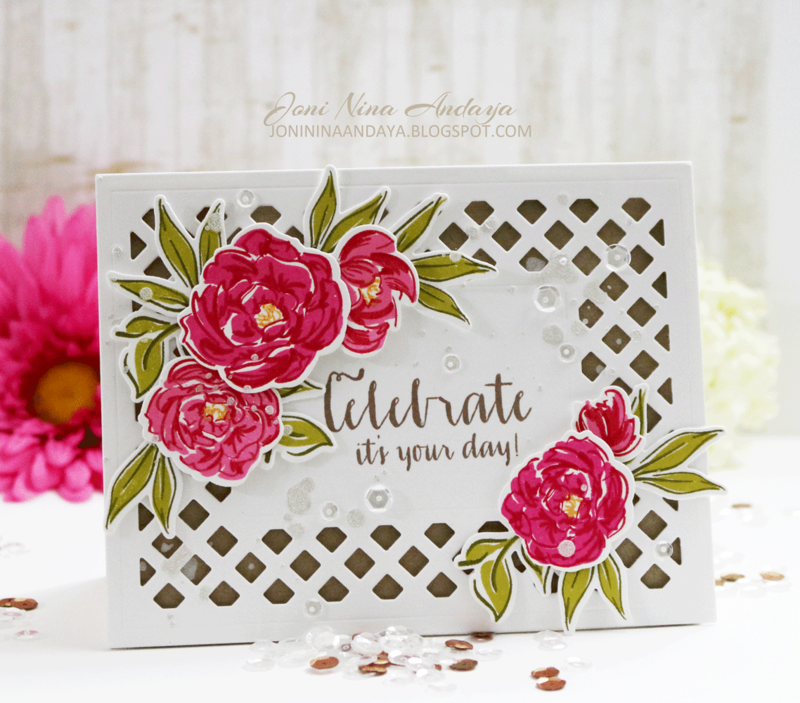 Beautiful cards--I love these new floral sets!! I am ALWAYS amazed by your talent! Your style is the way I like it, Classy, Innovative and OH so Gorgeous!!!!! PLEASE show us videos on the process of this cards! Thanks for the inspiration! Joni!!! These are insanely beautiful!!!! Loooooove! Oh dear, this whole release is calling my name! Very pretty cards. Love how you colored the pretty flowers. These stamps and dies are awesome. These are breath taking! Have to have them! The 1st card is stunning but my heart goes to the last one lol beautiful work!! You have done glorious wonders with these stamps and the lattice die is to "die" for. I must have that die! Gorgeous work!! Oh my!!! What STUNNING cards!! I want these stamps!! Absolutely GORGEOUS!! LOVING those flowers!!!!!!!! OH wow = GORGEOUS!!! Love every detail! WOW!!!! amazing release and very beautiful cards!! LOVE them all!! Simply stunning!! Your cards are just breath taking! Really gorgeous! I love everything! What pretty cards! I love the colors you chose. Ohmy.... I don't have enough words to describe...how I love these! So ..so beautiful, Joni! Your cards are just stunning. My gosh those are some really gorgeous cards! What a great stamp set! Beautiful!!!! Love both cards! The stamp set and dies are fabulous! Your cards are so pretty. Anyone would feel very special receiving one. Love both of your cards: they are so beautiful!!! I just love what you made with these sets and can't wait to play with them. Flowers are my all-time favourite stamps! Absolutely love your cards. The colors of the flowers mixed with the gold sentiment are pure perfection to me. Beautiful! 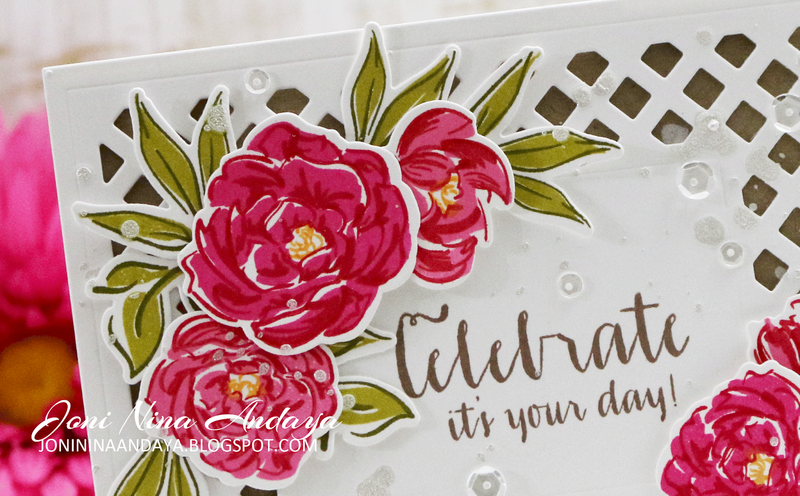 I just love these floral images and also the way you embossed the sentiment on vellum and fussy cut it out. Such absolutely stunning cards, Joni! As always! Beautiful Joni! You do florals like no one else...amazing!